Throughout each month, I'll be keeping a skin care diary and jotting down what I use on a daily basis. At the end of the month, I'll tally up what has been used the most and share the products with you. I have combination skin that can change between being extremely dry, spot prone, oily and sensitive as well as having eczema flare ups. 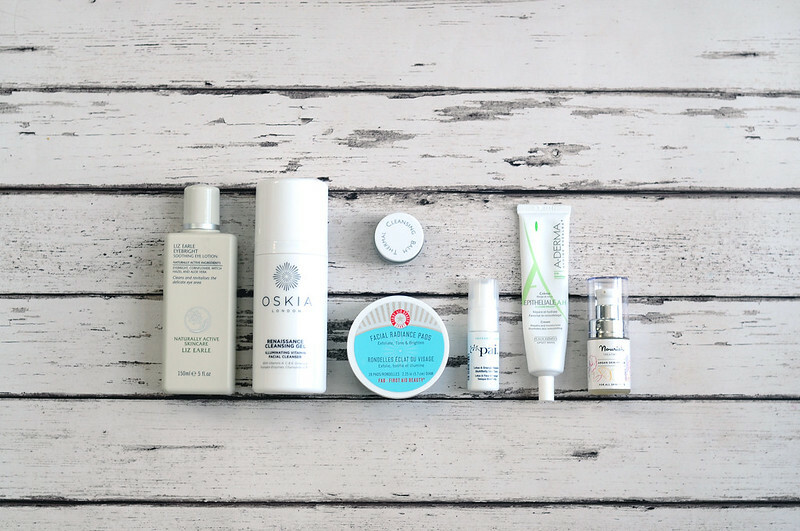 Liz Earle Eye Bright | Oskia Renaissance Cleansing Gel | Omorovicza Thermal Cleansing Balm | First Aid Beauty Facial Radiance Pads | Pai Lotus And Orange Blossom Toner | A-Derma Epthielle A.H Cream | Nourish Argan Skin Rescue. I've started using a mini pot of Omorovicza Thermal Cleansing Balm this month and it's made me miss it so much and that I really need to buy the full size of it at some point after using up three of these minis. It's one that my skin agrees with and is just really nice to use. Another product that I need to buy the full size of, but am holding back because I have so many others to use up first, is the Pai Toner. It's gentle and perfect for my sensitive skin and works well with the FAB exfoliating pads. My eczema has been playing up a bit this month so I've brought back the A-Derma moisturiser back into play as it's a miracle worker.